Brilliantly designed and executed, this App. 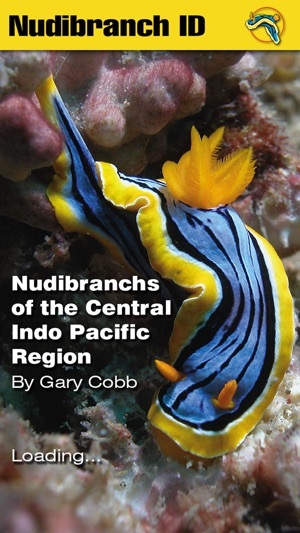 is without doubt the best Nudibranch Identification eGuide available and will no doubt become criteria that all others will be judged by. Not only does it have the greatest number of species, (700) every image is exquisite and the best available. The functions are simply astounding and it is plain to see that the writer, author, major photographer and developer, not only has a great love of his subject, BUT also has a thorough understanding of his production and need for well thought out precision for a large range of search functions and criteria. The introductions to specific groups has been written with the reader in mind and has precise information, uncluttered by too much scientific jargon and polished with "easy to read" facts in layman's terms, yet its scientific thoroughness is no less by any means. I have no hesitation in recommending this App. 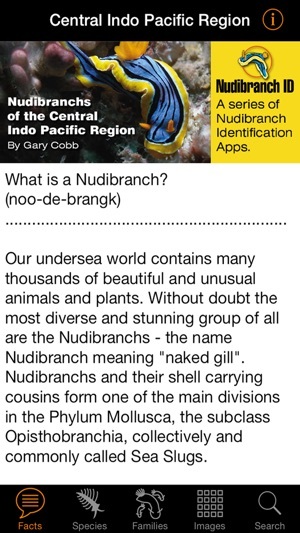 to anybody with the slightest interest in Marine Natural History, be they Scuba diver, snorkeler, student, naturalist, or reefcomber, as the most up to date, convenient and precision App. 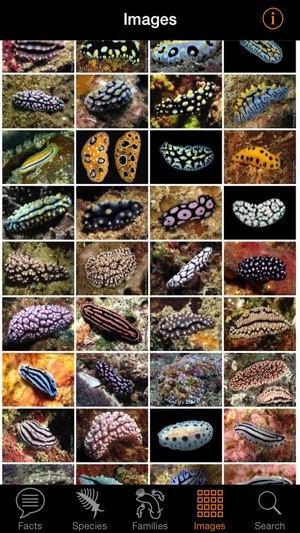 for the identification of Nudibranchs and if you haven't been hooked yet, you will be. Once around the block on this App. and it will have you "begging for more!" What a great app. I have been using it for only a short time but am very impressed with the range of critters, the photos and, especially, the search functions. I love the ability to search by colours and the checklist function. It former has enabled me to id. critters that I could not find leafing through texts. Sent a photo of one I could not id. to the author and he responded promptly with the id. and offered to make some changes in the next update that will improve the versitility even more - talk about service! 700 species - so many more to find. 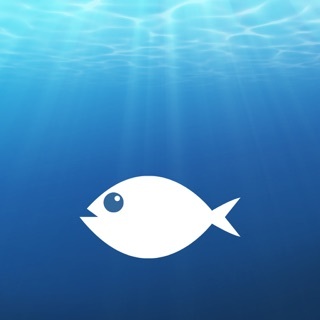 If only my iPhone worked under water the app. would be perfect! 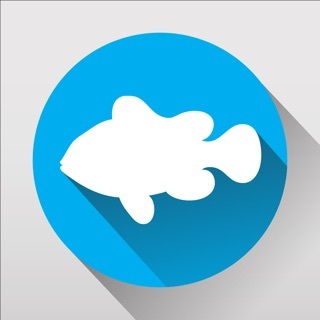 This app has great potential and is a good start, but still needs a bit of work. 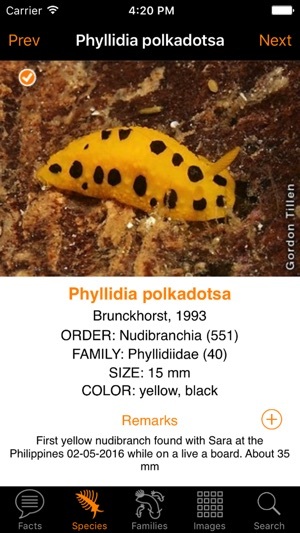 More species in the database is always good, but the photos could be better resolution and *please* optimise the app for iPad. 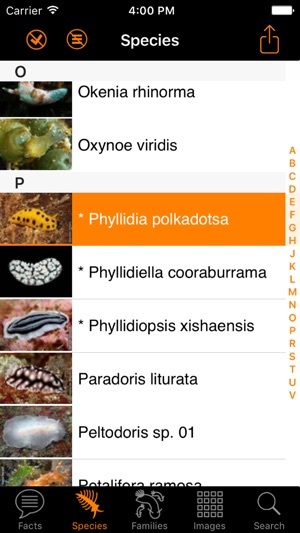 I am a dive instructor and marine biologist and want to use this to identify nudi's I find - the resolution of the photos is often too poor for that, even on iPhone. I love the search function but it could be tweaked - when you search for something, you need a way to click on an animal, then return to the list - at present you have to go back through the whole process. Maybe a set of breadcrumbs and the ability to swipe to view other animals in the search shortlist? Also including the range of distribution in the description would be very useful. Anyway, great start and I'm thrilled that there is something out there - but introduce more functionality and bigger pics and I will tell everyone I meet to buy it!